Transformative leadership is a team effort. It requires constructive dialogue between Transactional leaders (the implementers) and Visionary leaders (the dreamers). It's through the dialogue between these two groups that a new tacit worldview emerges. So who are the Visionary Leaders, and who are the transactional leaders? From when we are born our interaction with the world around us stimulates our brain. We quickly begin to develop preferences for some forms of stimulation over others. By late adolescence these preferences are virtually "set in concrete" and we have developed a preference for one of four ways of relating to the world around us: things-abstract, concrete-things, concrete-people, or people-abstract. Below, each of these four ways of dialoguing with reality are briefly described along with preferred leadership modus operandi. These are people who have a preference for using their hands to "tinker" with or to create things and to use their intellect to develop models or plans. They rely mostly on discovering things about the world through thinking about it and intellectually analysing it. They prefer to gather information visually. They are the "accidental leaders" because they will often create a technology which everyone else wants. People such as Bill Gates and the inventor of Facebook are examples. People with this brain-preference are not particularly interested in politics, they are the "corporatists" and would be quite comfortable living a totally privatized world. Those who belong to this brain-preference will be seen as visionary leaders if people like the technology they have created. These are "hands on" people who like certainty and like activities/organisations to be well structured. They prefer things to be down-to-earth rather than abstract and intangible. People with this preference may be athletes, mechanics, surgeons, gardeners, accountants, farmers, etc. They will prefer a political party which gives them certainty and a sense of security. They will also prefer a party which is conservative in its policies rather than one which comes up with innovative new (never-tried-before) policy. These people can be fabulous transactional leaders. Those who are masters of their craft will be sought out to teach others the best way to perform their chosen occupation. As with the Quality Producers, People Servants like structure. However, their preference is for spending time with and talking to people, rather than relating to the world of non-human things. They will choose careers as school teachers, actors, ethicists, priests/nuns, public servants, value consultants, etc. They will also prefer a party which is somewhat conservative in its policies, however, they will put people ahead of balancing the budget. So, if their party spends too much money on welfare (i.e. caring for those who can't care for themselves), their party will probably be voted out of office and a party supported by the Quality Producers will be voted back in on the promise of spending cuts to bring the budget back into surplus. People Servants are great facilitators, they are key to facilitating the oft difficult dialogue between the Visionary Leaders and the Transactional Leaders. Without this dialogue transformation is not possible. Understanding the worldviews and values of each group is essential to facilitating effective dialogue. The Social Architects, like the People Servants, prefer the world of people to the world of non-human things. Social Architects are comfortable functioning in a world of uncertainty--in fact it's their preference--too much of the "same old, same old" and they get bored. 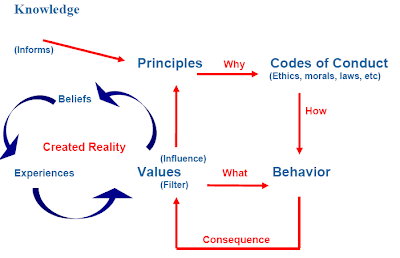 Social Architects like to create models to understand how people behave, they like designing new social systems. They are the "greens", social-ecologists, social-activists, social scientists, social policy planners, etc. in our society. These people are potential Visionary Leaders in respect of societal and/or organisational change. As with the facilitators, to be effective as a visionary leader they must be able to gain rapport with those the desire to influence. Remember, the key is to change is firstly gaining real rapport with people. And, for genuine rapport to exist, people must really know that you are able to see the world through their eyes and therefore understand what they have the values they have. In the video below, Matthew Taylor describes just how essential to our future are the coexistence of structure (maintaining world-views/transactional leadership), commitment and cohesiveness (the facilitative leader/mediator), and innovation (visionary leadership).